Natural light isn't only easier on the eyes —it uplifts the spirit and energizes the body, so that working is easier. These fine daylight-simulation lights are easy on the environment too, using 80% less electricity than a normal household bulb, and lasting up to 10 times longer. 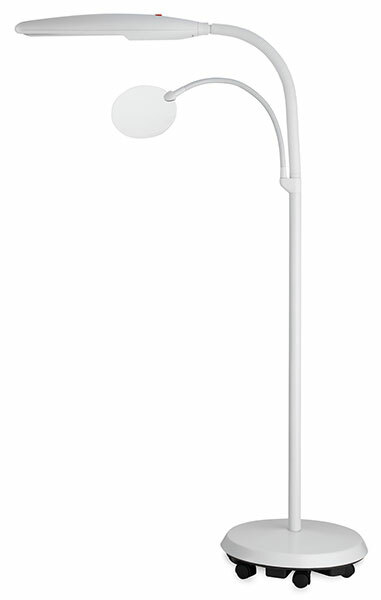 The 18W low heat daylight bulb allows perfect color matching while reducing eye strain. The light and a removable magnifying lens are individually mounted on long flexible arms, enabling you to find the perfect working position for any task. The solid, sturdy base is on four wheels and rolls effortlessly from room to room. 120V. 60 Hz. UL listed.